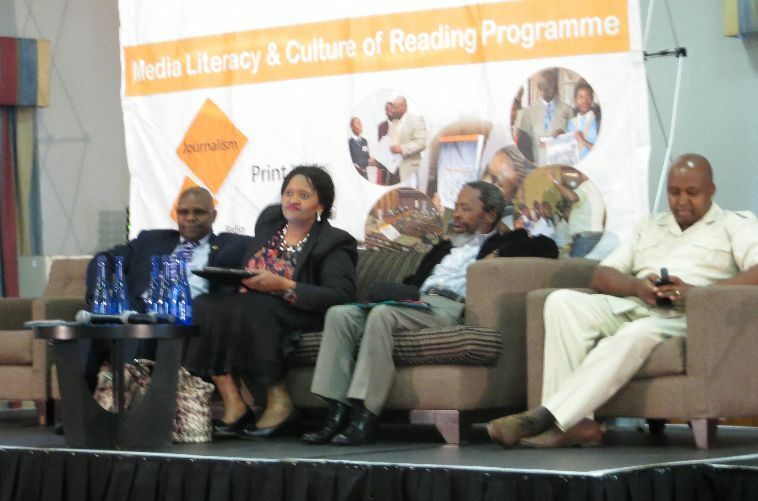 Journalism in all schools is what the Media Development and Diversity Summit decided that they would like. Journalism is already partially there, hidden in the curriculum under various headings such as “narrative” or “discursive” paragraphs, but the MDDA Summit would like to see schools all writing their own newsletters. This would encourage children to read newspapers and learn to be selective as to what the media are saying and not to believe everything. Other exciting developments were suggestions of having children read their own stories over community radio which would expose them to public speaking and a wider world. This would help develop self esteem and self confidence. This was a high profile Summit, and was attended by top calibre people. This included Ms Phelisa Nkomo, MDDA Board Chairperson, Mr Lumko Mtimde, MDDA Chief Executive Officer, Dr Shermain Mannah, Chief Director in the Department of Basic Education, and Professor Keorapetse Kgositsile, Advisor to the Minister of Arts and Culture. The Keynote address was given by the Honourable Obed Bapela, Deputy Minister in the Presidency. It also included people representing media of all kinds – radio, newspaper, SABC TV Education, Mother of all Professions, and also librarians and members of Departments of Education so the topic was widely discussed and good suggestions made for future development. A feather in our cap was the statement that KZN had got it right with their school newsletters. That was the result of our Dancing Pencils project with the MDDA in 2011. They did request a Power Point Presentation to showcase how Dancing Pencils trained young journalists in Nongoma and Ulundi had produced high quality professional newsletters. Felicity did a power point presentation explaining in detail from photographs she had taken at the Summit in Ulundi in 2011 and during the trainings in Nongoma and Ulundi later that year. We are very proud that we got it right! Also proud that recently a young man who trained with us in 2011 telephoned Felicity to say that he had decided to become a journalist and needed a lead in that direction which Felicity was able to help him with. We expect this project to develop further. The idea of our youth having a voice in the affairs of the country is tremendously powerful. Proper training for all concerned will bring about the desired result. Congratulations to the MDDA, and to Manana Stone, for hosting such a high power Summit. Read the National Media Literacy Summit Conclusions.